Reproductive Justice NB sent a survey on August 22 to all parties in the upcoming NB provincial elections, asking the parties to send the surveys to all their candidates. The survey asked candidates whether they supported (1) a repeal of regulations that have been identified as barriers to abortion access and (2) the extension of reproductive healthcare in the Province. The NDP and Green Party both responded collectively “yes” to these two questions. The other parties, Progressive Conservatives, NB Liberals and the Peoples Alliance of NB, chose not to respond to the questions. Le 20 août 2014, Justice Reproductive Nouveau-Brunswick a transmis un sondage aux cinq partis politiques enregistrés aux prochaines élections provinciales afin qu’il soit relayé aux candidates et candidats. Le sondage portait sur la justice reproductive et demandait leur appui pour: 1) abroger les règlements qui créent des obstacles entravant l’accès à l’avortement; et 2) étendre les services de santé reproductive dans la province. Le NPD et le Parti Vert y ont répondu favorablement. Les autres partis, le Parti-progressiste conservateur, le Parti Libéral et l’Alliance des gens du N.-B. n’ont pas répondu le sondage. 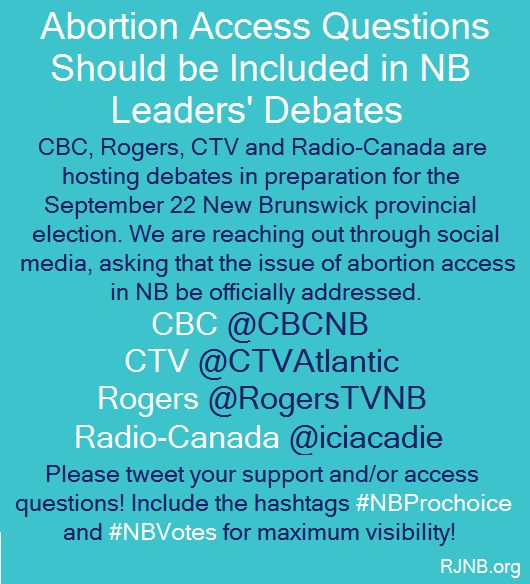 FREDERICTON, NB, August 28, 2014 – Reproductive Justice NB is calling on organizations and media outlets hosting leaders’ debates during the New Brunswick election to include questions about abortion access. As a leading healthcare issue facing the province, leaders must make their positions clear on how they would rectify the lack of safe, equitable and accessible reproductive health care for all New Brunswickers. Since announcing the clinic closure in April, there has been a groundswell of provincial and national support for New Brunswick’s restrictive abortion rules to change. An RJNB-led campaign to raise $100,000 to work to secure a lease for the clinic and recruit healthcare professionals with a pro-choice mandate reached its goal in less than two weeks. And on the eve of a provincial election, voters have taken to social media to express their concerns about lack of access. 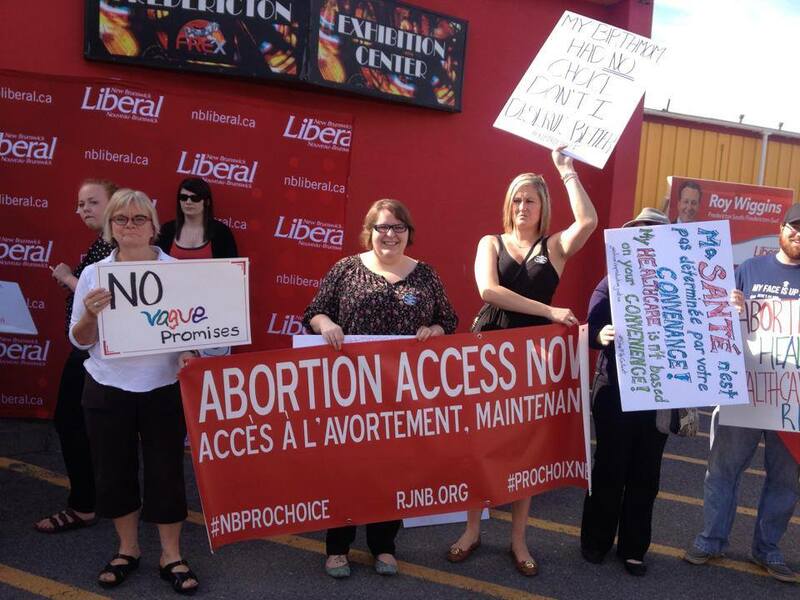 The provincial leaders running for office in the New Brunswick election have all answered questions about abortion access to some degree via media interviews. The various leaders’ debates (televised or not) will provide an opportunity for leaders to be clear on their stance on this critical health care issue that must be addressed. For more information about the crisis facing New Brunswickers, please visit: http://rjnb.org/ and follow us on Twitter @ReproJusticeNB and with the hashtag #NBProchoice.